Welcome to Vy Khanh hostel. It's run by FAMILY and located (safe place)at pack backer's area (district 1) walking distance to all activities,2 minutes walking to Bui Vien WALKING STREET, ( walking 7 minutes to Ben Thanh market), near bank, park,museums, zoo, coffee shops yet it's quiet enough since it situated in an alley. All rooms are equipped with air conditioners, portable fan, private bath with heated water, mini fridge, cable TV, wifi internet (free). Friendly staff, relaxing atmosphere, and home stay at a reasonable price. You will be comfortable and safe staying at our place. *Check- in time : after 14 o'clock (noon). You can check in before 14 o'clock If we have available room. If you have a more exact time of arrival, you can inform us by return email of your confirmation. Ms. Vy and her father are absolutely lovely! I felt well looked after during my stay at the guesthouse and even after checking out to join my tour group. Ms. Vy assured me that if there was anything at all that I needed, I could contact her at any time. Her map of HCMC that she gives her guests is EVERYTHING!! I studied it well and did/saw nearly everything that she recommended. Great clean place. Vy was super helpful and sweet as were her parents. Great location right in the heart of district 1 but in an alley which helps block off noise. If you are a light sleeper ask for a higher floor no noise up there. Great value. Lovely guesthouse with great local tips and a really warm welcome. Rooms are comfortable(air con is amazing) And very close to tourist area (although amazingly quiet -I hadn't realised it was near a popular street for drinking until my second night there and it was the weekend !) Great base for exploring the city. Thanks Vy! This is without doubt the best guesthouse I have ever stayed in. Ms Vy invites you into her world and starts the proceedings with her custom made map, containing a wealth of information including tour prices, local places to eat, ect. I was taken aback by the owners generosity when she helped me find a local antiques market. The Khanh family are at the forefront of hospitality and with over 10 years in the business it shows. Stay here and experience the perfect guesthouse! I absolutely loved staying at Vy’s. The place is in amazing location and great value for money. Vy is such a lovely and helpful person and her tour around the city (not so touristic spots) was great. It was such a nice stay I came back there for my onward trip and didn’t regret it. 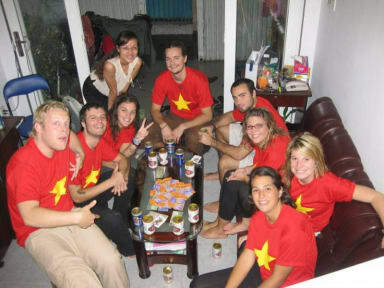 The perfect hostel if you’re looking to be close to the party and lively area of Ho Chi Minh without the loudness and party vibes you get with other hostels! The beds and pillows were comfortable, the shower hot and the A/C kept the room cool - what else does a traveller need? Also a special mention to the host who was absolutely brilliant. There’s a genuine difference between a host caring about their guests because they need to and because they want to and she certainly showed that! Such lovely staff! Stayed here 7 nights and only had one issue that they fixed really quickly, rooms were clean and had A/C. Ms Vy even gave us both a tiny knitted strawberry as a present! Also there's a quality Indian Restaurant nextdoor. The owner has such a kind soul.We were leaving for Cambodia the next morning and had nothing planned.Not only did she sort out transport. She exchanged dong into $us and showed us where to get our passport pictures taken for the Visa.She had maps with restaurants and entertainment highlighted. Reccomended a great pho place for our last meal and had lemonade and coffee waiting for us both as we arrived and as we left. The room was nice and clean, very quiet but only a short walk from everything . Vy’s place was perfect! She was a very helpful host. On the first night, she took me and a few other guests on a four hour walking tour, helping us buy street food and see areas and experiences that we may otherwise not have done. The location is right in the middle of the main backpackers area, but still quiet at night. It’s only about a 10-20 minute walk from most main sights (Reunification palace, war remnants museum, opera, etc).